Price per dial pack containing 6 cells. Also Cross Reference: DA13, 13HPX, AC13E, AC13, L13ZA, 13A, 13E, R13ZA, B26PA, ME8Z. 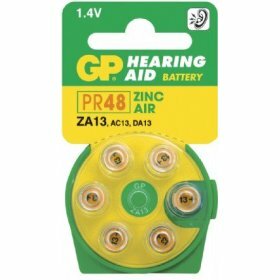 GP Zinc Air hearing aid batteries, with enhanced feature such as stable operating voltage over a wide operating temperature, are uniquely built to offer excellent performance.